On-demand video streaming is a popular application which accounts for a large share of today's Internet traffic. Dynamic Adaptive Streaming over HTTP (DASH) is the major streaming technology used by large content providers. However, this technology suffers from performance problems when multiple clients are streaming on shared network links. 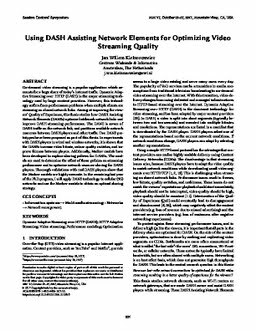 Aiming at improving the viewers' Quality of Experience, this thesis studies how DASH Assisting Network Elements (DANEs) optimize bottleneck network links and improve DASH streaming performance. The DANE is aware of DASH traffic on the network link, and partitions available network resources between DASH players and other traffic. Two DANE prototypes have been proposed as part of this thesis. In experiments with DASH players in wired and wireless networks, it is shown that the DANEs increase video bitrate, reduce quality switches, and improve fairness between players. Additionally, Markov models have been developed to explore sharing policies for DANEs. The models are used to determine the effect of those policies on streaming performance and to optimize network resource sharing for DASH players. Thorough validations with real DASH players show that the Markov models are highly accurate. In the remaining last year of the PhD program, I will apply DANE technology to cellular (5G) networks and use the Markov models to obtain an optimal sharing strategy.